Yes! Rush me Dr. Iverson's brand new program, Unleash Your Success in a printed 2 Volume set. I understand that I can also download the program as an eBook, immediately after purchase, so I can get started right away towards launching myself into a better financial life, with improved health, greater mental & emotional control and incredible relationships. The Quick-Start Audio program to turbo boost your success. Eligible to Receive a One-Time-Only Discounted Offer! Since you are ordering today, you have the opportunity to Upgrade your Unleash Your Success purchase to include my new success boosting Audio Program CD — “Negative Self-Talk Eliminator” for a savings of 40% OFF of the normal retail price. This is a one-time offer and will not be repeated EVER! This discount is good only for today. 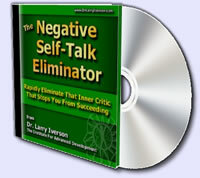 Using Negative Self-Talk Eliminator will launch you toward your success! Through using this amazing Audio Program before you apply the strategies in Unleash Your Success, you’ll rapidly overcome the inner-critic that stops success. One of the biggest blocks to achievement for the majority of people, is the internal criticism and negative self-talk that discourages them, and thereby stops them from taking the action necessary to succeed. Everyone has many types of self-talk. Some self-talk encourages, supports and coaches you into achievement. Other self-talk picks, blames, creates guilt, scares and generally discourages you. A crucial step to attaining your goals and dreams is getting your internal dialogue to energize and encourage your success. You must get the negative barriers out of your way! This one-time offer is a perfect addition to kick-off the program. One of the best things you could ever do for yourself is to Eliminate that Negative Critic that limits your success! I only want to purchase the Unleash Your Success program.